As I mentioned last week, I am guest designing for One Stop Craft Challenge and have been having a blast! 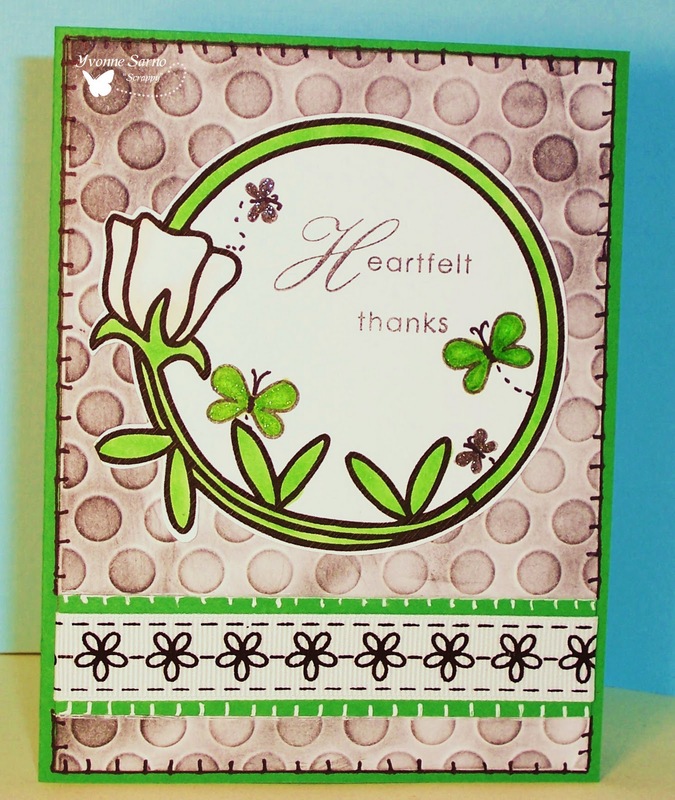 My card below features Bugaboo Stamps Flower Tags! Isn't this perfect for their new color challenge - White and Black + one color of your choice? This card is also perfect for the Bugaboo Stamps Catch the Bug Challenge this week! This week at Catch the Bug we have everyones favorite challenge theme again - Anything Goes! To dig out your Stampin' Mojo and play along at One Stop Crafts and Catch the Bug! We can't wait to see what you create! Celebrate the Occasion - Any Occasion - w/ Green, white and 1 more color. Scrappy, this is gorgeous and so different!!! I love it!!! That background is so clever!!! :D MWAH! 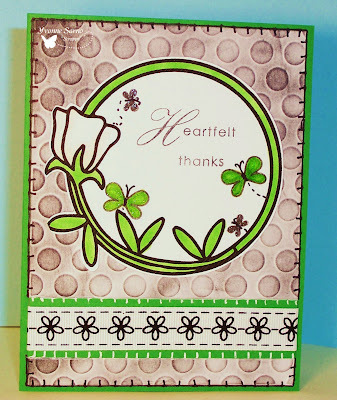 This is such a sweet card Scrappy ! Love the border and the little butterflies ! Cute ! Very neat! I love the polka dots! Thanks for playing along with us this week at CTO! What a wonderful creation Scrappy! Really nice card, love the embossing, I hope you do well with all the challenges! Thanks so much for Celebrating the Occasion with us! Nice card, love the colours you've used! Thanks for sharing with us at DWA! Great thank you card! I have not seen Bugaboo's flower tags. I think I'm going to like them. Thank you for joining our GREEN challenge at DYSU. Good luck! This is so pretty Scrappy!! Thanks so much for sharing with us this week at Penny's. Good Luck!! Very cute card! Thanks for playing along at CTO. This card is so very pretty. Thanks for joining our animal-challenge at Meljen's Design Team & Challenge Blog! Beautiuful card! And way to go with all the challenges it fits into! Good luck and thanks for playing at CTO! Very nice card! I love the cute little butterflies! Thanks for playing along with us at CTO! So different! I love it! Thanks for celebrating with us this week at CTO!! Such a bold card! Wonderful! Thanks so much for joining in the fun this week at DYSU! It’s so fun to see so many different takes on our Green challenge! Lovely look for this card. :-) The splash of green is pretty with the b & w. Thanks so much for joining us for this weeks challenge at Digi Doodle Shop's Best! Great embossing!! Love how your card turned out!! Thanks so much for joining us at CTO this week!! I love what you did with the background! It is a beautiful card! Thanks for Celebrating the Occasion with us! Love those textured polka dots!! Thanks for splashing with us at The Play Date Cafe! Very nice card...I'm amazed at all the challenges you were able to enter this card in! Good Luck! Thanks for Celebrating The Occasion with us! cute spotty background :) Thanks for joining us at the Play Date Cafe! Great card, that green really "pops" out against the black & white. Great job! very pretty. Thanks for playing with us at Craft Us Crazy. LOVE the way you've framed your sentiment and that fun, polka dot background! Thanks so much for playing along with us, this week, in The Cafe! This is a lovely card. The the image you have used to frame the sentiment. Like your embossing too. Thanks for joining us at Craft Us Crazy this time and hope to see you for the next challenge too! Very Pretty, Thank You so very much for sharing your creation with us at MelJen's Designs this week. beautiful ;) Thank you for joining our animal-challenge at Meljen's Design last week... hope you will join us again this week ! Good Luck! A fab card. I love the polka dots. Thank you for joining us at Creative Craft. What an sweet spring-like card. Thanks for playing along with us at Mami Doodle.